After surgical strike on black money, NaMo has warned benami property holders that his next step would be against them. While addressing the nation in Goa Prime Minister Modi has said that taking action against benami property would be the major step towards eradicating black money and corruption. If reports are to be believed 200 teams have already been formed to prepare lists of benami property throughout the country. So in this article we will learn about benami transactions and consequences of holding benami properties. Read: Are you Stashing Black Money Unknowingly? 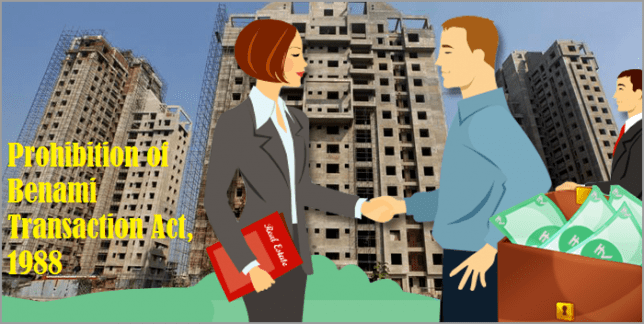 What is the meaning of Benami Property / Transaction? What are not benami transactions? How to determine whether the property is a Benami Property or not? What is the penalty for entering in benami transactions or holding benami property? The Benami Transactions (Prohibition) Amendment Act, 2016 is a modified version of older Benami?Transactions (Prohibition) Act 1988 and was tabled in Lok Sabha last year by Finance Minister Arun Jaitley. The same is passed by the Lok Sabha on 27th July and Rajya Sabha on 2nd August this year respectively. The rules and provisions of the Benami Transactions (Prohibition) Act made effective from 1st November, 2016 and is now renamed as Prohibition of Benami Property Transactions Act, 1988 (PBPT Act). Benami means a ?Property without a Name?. Here property includes movable, immovable, tangible, intangible, any right or interest, or legal documents, even gold or financial securities could qualify to be benami. In the layman term Benami Transaction is a transaction where the property is purchased in the name of the person who has not paid for it. The person who has rendered the required money for the said transactions is not named in the transaction but the property is held for the immediate or future benefit, direct or indirect, of the person who has provided its payment. For example if you want to buy a piece of land but don?t want your name to be appeared in the deal then you can buy the same in the name of your sister. This is called benami transaction because you have paid the money but the owner is your sister. The act defines the benami transaction as a transaction or an arrangement where a property is held by or transferred to a person, but has been provided for or paid by another person. This practice has started mainly due to superstition where some names or alphabets were considered lucky and some unlucky. Another reason was to hide family affairs from public eye or to evade wealth tax. This concept is used widely by con people to do fraudulent activities. For instance if Mr A is highly indebted, he would purchase property in the name of Mr Z, so that Mr A?s creditors could not attach such property for recovery. This malpractice is also adopted by corrupt Government official who take bribe in kind such as land, properties, cars, jewellery etc. Since they cannot directly get these on their or their family member?s name, the same is done in name of their in-laws, cousins, close friends etc. Person holding the property has no knowledge about the transaction mode or ownership of the property. A person who has provided the required money for the transaction is no longer traceable. Person holding the property or the person on whose name the property has been transferred has not paid the money or the price of the property in question is paid by someone else. The bill defines benamidar as the person whose name is appeared on the paper i.e. the person on whose name the benami property is bought held or transferred. Sources of the fund which were used for making the payment for the property is disclosed by the buyer or not. Intention behind buying property in the name of another person i.e. spouse, children, siblings etc. Actual Possession of the property and custodian of the documents of the property. Disclosure of the income from the property, if any, while filing income tax return. If above questions lead to the fact that property is purchased to take various benefits under government schemes, interests, rebates etc. and not to hide black money or any fraudulent activities, the said property will not be treated as benami property. Based on the order of Adjudicating Authority, the Administrator will confiscate the property in a manner and subject to the conditions as prescribed under the law. In case the individual is not satisfied with the order of adjudicating authority, he can challenge the same with Appellate Tribunal, and if he is not satisfied with the order of Appellate Tribunal, the appeal can be made with High Court. Sir, My question is if a person”A” is President/Chairman of the co-operative Bank, Mr A transfer his residencial sites in third party (not a relative) “B” with the intension of raising a huge loan, the transfer is by registering with the registering authority and after transferring if he raises loan on the said property uses A for his personal purposes and after two or three years the same mortgage property transfer in his name or in his family members name, and the loan of “B” is closed by transferring the loan money from Mr.”A” savings account, will it be a Benami transaction. Please explain I will be most grateful and thankful. I bought a flat in my in laws name to make them settle down next door to take care of our aililng mother in law in nov2011, unfortunately she is no more now. I paid for the flat by withdrawing money from my pf and taking loan from my office, all cheques and no illigal money. Even paid the payments through cheque. However they could not shift to this property for some reason and the property was transferred to my wife as first allotte and me second allotee by a gift deed in oct 2012. paying the reqd stamp duty. Q1. Is this case of benami transaction. Q2 there is no malpeactise involved either in money paid or intentions of buying that property as i was helping my inlaws to settle down with us since they did not have money to purchase the property. Means we are innocent benamidars or beneficiery, if we are. Q3. If we are at fault unknowingly what should we do to keep ourselves out of the mess. Thanks for giving us a clear information on benami property.now i want to ask one thingh.my grand father brought one property in his fathers name in the yer 1960.acording to to this law one should buy property in his parents name. So is this a benami property? ?should it be rectified now??? If yes how? What will be the legal steps?? Is property purchased with family loan considered as Benami? like married daughter gave loan to mother for property purchase/. Also, it would be useful if you could tell us whether the new Act has a retrospective or prospective application? clear & succint! good job. Dear Sanyam.. Very well written article. Crisp & Concise ! Dear sanyam,…. you made me understand whats benami property and every thing related to that. but there is one question i want to ask as i am not able to understand. if a company tells me to buy a property on my name (register and buy) and then latter transfer that property to the company back but with known source of income so will it be falling under benami act? please do reply as soon as possible !